We come to invoke your help, confident of experiencing your goodness and your power, the consolation of so many people. Pray for us to the Father of mercies. In our name, speak to him that we may obtain the particular graces we need. True follower of St. Francis, help us to imitate your life and work for God and for our brothers and sisters in the Lord. Put into our hearts the flame of your love that we that we may love our merciful Father in heaven and our neighbors as ourselves. Pray that we may fulfill the will of our heavenly Father, and live the way Jesus shows us in the Gospels. Be a guide for us this day that we may recognize the opportunities God gives us to be selfless and not selfish. Assist us in keeping the promises we made at our baptism. Help us to obtain the grace to walk in the light of faith, and to proclaim that faith by the way we live. Guide our devotion so that we may live with you the Gospel of Christ and grow with you in his love. Amen. St. Anthony, light of the Holy Church, lover of God’s Law and Doctor of the Gospel, pray for us to the Son of God. 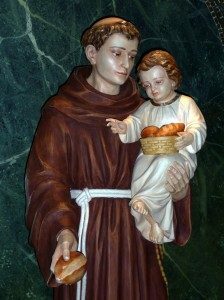 Good St. Anthony, in your own life you brought together deep learning and great holiness. Take up our petitions and prayers and make them your own. Bless and comfort all who turn to you. With your good example before us, may we persevere in running the race. Good friar and friend, walk with us as we journey in life until at length we arrive at the fullness of our Lord Jesus Christ. Amen.